Hmmm, I'm not seeing a WCB #37 up yet at Eat Stuff. . . guess I should wait? He's just helping make sure the soil is packed firm. That's all. Really. Wow, for once I beat Clare to WCB, despite their being 17 hours ahead of us. I guess she and Kiri must be out partying or enjoying Sunday brunch or something. Check back later at Eat Stuff--I know they won't miss WCB! Apologies for any confusion. Mmm. 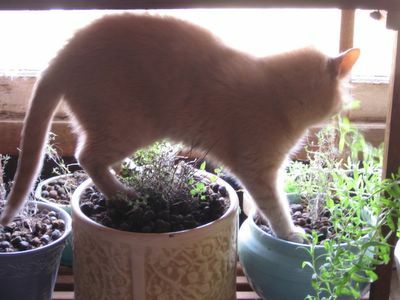 So it's your theory that chickens dress up like cats to deface houseplants, Jeff-y, my dear? How clever. You know what they call an animal who doesn't know enough to come in from the cold? Here's a hint: It's not "burro." He must have a green, non-opposable thumb! it's too funny the things that cats will get into to satisfy their own needs. She could have walked on the ground...but no! If the shoe fits, lindy (the chiocken)....everyone knows chickenz are devlish, at best....why do you think they are called deviled eggs? FG, are you going to let a chicken call Dan nasty names? Have you hugged a jacka** today? Who's talking about Dan, Jeff-y? !! OMG, I've been smacked down by a chicken!! I think Molly has spring fever. She's found the next best thing to being outside! Okay, this is at least the fourth time I've come over here to respond to comments. But Jeff, Lindy, and Dan are making me nervous. I think I'd better just stay out of this. Besides, I don't know if I could handle being smacked down by a chicken. Or a donkey. Or Jeff. Or The Doodle Monster for that matter. Geez, am I a wuss or what? Maybe. But a smart wuss!